In the post “Walking Myaamionki” we explored how Myaamia people first settled the Waapaahšiki Siipiiwi (Wabash River). That post left off with the question: what held all these unique villages, spread over hundreds of miles, together as a group? Prior to contact with Europeans, each village had their own leaders and made most of their own decisions, and no village could command the allegiance of any other village. Yet, when the need arose, these villages could come together and work for a common purpose. Our ancestors recognized their interdependence and interrelatedness. They saw themselves as relatives of an extended family of villages physically connected by the rivers and trails that ran throughout Myaamionki. They saw this Myaamia family as unique and different from other “families” in their area like the Ojibwa, Potawatomi, Ottawa, Shawnee, Wyandot, and Kickapoo. So what made our Myaamia family unique, and what held us together as a separate group from other neighboring families with whom we shared our homelands? In these early years, there were two foundational elements that made us unique: the language we spoke and the specific place where we lived. Today, linguists call our language Miami-Illinois, because both the Miami and Illinois people spoke different dialects of the same language. The Myaamia people of the Waapaahšiki Siipiiwi (Wabash River) and the Inoka people of the Inoka Siipiiwi (Illinois River) both spoke Miami-Illinois. It was the means of communication used by these people in their daily lives. Through their shared language our ancestors preserved the stories of their past experiences and made decisions about what to do in their contemporary lives. Miami-Illinois was the language in common in these villages, but it was not the only language spoken there. The villages of both these river valleys were always multilingual. Within the village there would have been spouses, adoptees, and captives from other language groups. Each community valued the ability to communicate with groups that spoke other languages. These multilingual individuals helped their home community build and maintain the alliances that established peace and allowed for the exchange of important goods. Often, the children would be taught all of the languages spoken by their parents so that they could continue this important work. These language skills would also allow them to visit with extended family in other villages. The presence of all of these languages within each village did not, however, create competition among languages. Miami-Illinois was always the central language of the village; it was the communications glue that bound these groups together. Miami-Illinois also connected all of the Myaamia and Inoka villages of the Wabash and Illinois River Valleys. Through this shared language, the villages passed on information, stories, songs, speeches, and other meaning filled messages. This ease of communication and the feelings of being collectively understood bonded these villages together in a comforting closeness. This linguistic bond is one major reason why the Myaamia and the Inoka (Illinois) saw themselves as extremely close relatives. They often referred to each other as siblings. The second foundational element that linked the Myaamia villages of the Waapaahšiki Siipiiwi together as a unique group was the place where they lived. The villages of the Waapaahšiki Siipiiwi had much in common as a result of living in nearly the same environment for untold numbers of generations. We call this place Myaamionki (the place of the Myaamia). Myaamionki continues to include: landscape features; the earth beneath the surface of the land; rivers and other bodies of water; the sky and celestial objects like the sun, the moon, and the stars; the plants and animals with whom we share our place; and many different groups of humans. Within Myaamionki the soils, earth, and rocks beneath the feet of our ancestors were very similar. This led the villages to farm in the same way and to make their tools from the same materials. The river valleys of Myaamionki flooded regularly and fertilized the flood plains near their villages. The river valley also had a shared climate and nearly the same quantity of frost free growing days. In general, this environment was suited to the farming of Myaamia miincipi (Miami corn). It was something that all our ancestors’ villages participated in and as a result each village would have been heavily influenced by the agricultural cycle of their corn. The forests of the Wabash River Valley also tended to be either oak-hickory or beech-maple. Within these forested environments all Myaamia people would have generally found the same plants and animals and therefore eaten the same roots, nuts, greens, berries, and animal meats. These villages would have also shared the same overlapping hunting and gathering grounds. 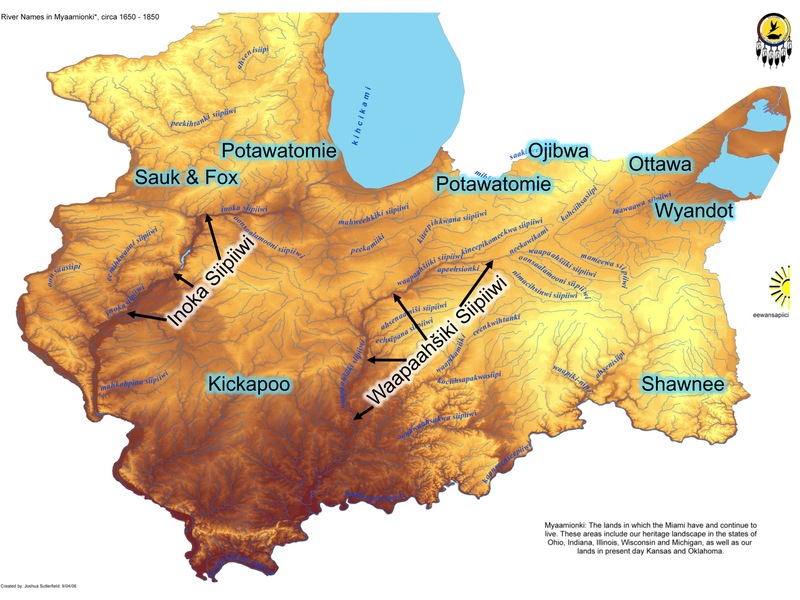 Hunting and gathering regularly occurred as far west as the Mihšisiipi (Mississippi River), as far east as the Scioto River, and as far south as the Kaanseenseepiiwi (Ohio River). This was a landscape shared by many villages and the use of these resources required a lot of negotiation and communication. 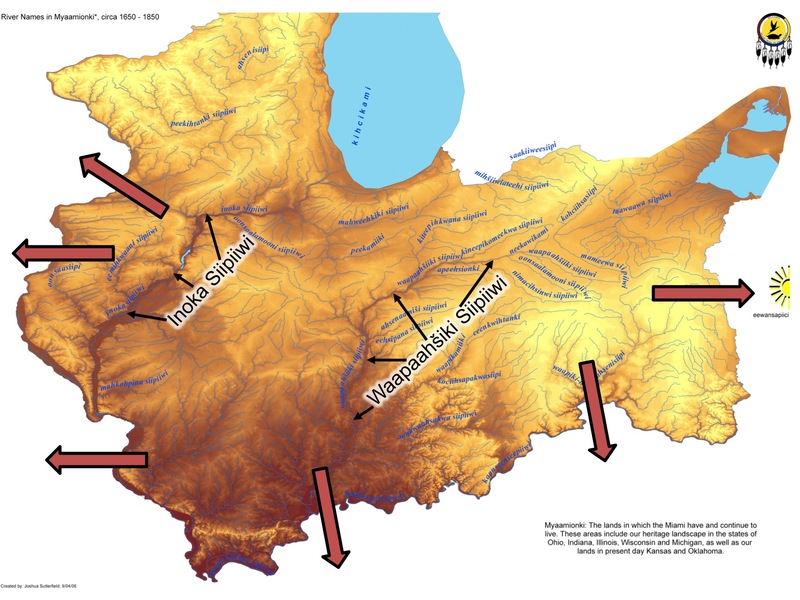 The Wabash River Valley was also pocketed with hundreds of wetland areas where Myaamia people gathered tubers, roots, and greens for their daily diet as well as medicinal cures to typical ailments. Each village along the Waapaahšiki Siipiiwi would have differed only slightly from the others in terms of available plants and animals. These variations were noted in the names of some villages. For example, Aciipihkahkionki – the place of roots – was unique for the abundance of edible tubers that could be found in the surrounding wetlands (see the post “Walking Myaamionki” on this blog). These differences would have given each village a unique flavor, but they would not have created a radical sense of difference between the related villages. All of the Myaamia villages of the valley used nearly the same lunar calendar system. The lunar calendar was used to track the ecological changes occurring over the course of the year. It was this system that helped each village know when it was time to plant, hunt, harvest, and rest. The lunar calendar embodied our ancestors’ knowledge of the rhythms of climate, weather, plants, animals, and humans that was key to thriving in Myaamionki. The villages lived in tune to the same rhythms and as a result their collective lives – the things they did every day – ran parallel to each other. These habits contributed to the sense of sameness established by shared language and a similar historical experience. Within Myaamionki (the place of the Miami) most of the rivers and trails linked villages together in a peaceful way. Most of our ancestors’ near neighbors were considered relatives. The Inoka (Illinois) were considered close siblings; the Ojibwa, Potawatomi, Shawnee, Ottawa, and Wyandot were elder brothers; and the Delaware we called grandfathers. These alliances were reaffirmed on a regular basis by exchanging gifts, visiting each other regularly, and giving long speeches that recounted the history of the alliance and reaffirmed each community’s commitment to the relationship. Outside of Myaamionki, most of the rivers and trails were utilized for less than peaceful purposes. At rare moments our ancestors left Myaamionki to hunt or trade, but more commonly they journeyed beyond Myaamionki to make war. Prior to contact with Europeans, war usually involved groups of twenty-five to thirty men. This group, or war-party as it is often called in English, would journey for weeks in order to attack an enemy village and take a few captives back home to their village. In cases of revenge, the war-party might make the journey with express purpose of killing a few adult males in an enemy community. Most captives were brought back to the home village in order to be adopted into the community, thereby adding new strength to the village. Prior to contact, the groups our ancestors most commonly made war against were the Osage, Quapaw, Lakota, Dakota, Chickasaw, Choctaw, Creek, Cherokee, and Haudenosaunee. These groups would often make revenge raids on the villages of our ancestors as well. These back and forth raids often led a cycle of violence, which historians have called “mourning wars.” In these kinds of conflicts, the grief and loss of power caused by the death of community members pushes the community to seek vengeance or to replace the loss with captives. When these conflicts cycled out of control, a community could choose to send an ambassador to negotiate a peaceful settlement. This dangerous task was undertaken by an akima (civil leader) at the request of his village. He would then journey via river and trail to the village of an enemy and request a peace negotiation. This was a dangerous journey and the akima had to travel unarmed as a visible sign of his community’s peaceful intent. If he arrived safely at his destination he would then have to convince the leaders of that village that peace was desirable. If this initial meeting was successful, then the communities would come together at a later date to exchange gifts and give formal speeches that would firmly establish a new peace. In many cases, but not all, Myaamia villages would communicate with each other regarding issues of both war and peace. Enemies may have been unable to distinguish between Myaamia villages and as a result a revenge raid could hit any village. In the same vein, a sustainable peace required that other Myaamia villages were also in agreement. Without unity among Myaamia villages no peace agreement would be lasting. In this way, both war and peace served to keep Myaamia villages in communication with each other and unified to certain degree. This unity had to be constantly negotiated and required a lot of compromise, but we know that for the most part our ancestors were successful in maintaining the close ties within the Myaamia family and their extended ties to the related families who lived all around them. The rivers and trails that crisscrossed Myaamionki were the pathways by which communities were connected to each other. Some of these connections were peaceful, filled with exchange, good words, and negotiated agreements for how to share the resources of our homelands. Other connections were violent and were used to achieve revenge, vent grief, and to steal power from an enemy community through capturing their people. These connections combined with a shared language, a common place, and a similar historical experience created a sense of family unity among Myaamia villages. This close-knit Myaamia family was unique and separate from other groups, but it was also loose and flexible. No village could be forced to do anything. The family stayed together because they worked diligently to create compromise within the group. This Myaamia family is what Europeans encountered and gave the foreign label: tribe. Today, Myaamionki has grown to include our place in Kansas and the sovereign center of our Nation in Oklahoma. Our population lives just about everywhere in the United States and even beyond, and as a result the trails that link us together have stretched and expanded far beyond Myaamionki. Some of these trails are highways and interstates, while others pass through the sky by airplanes or by along the rails by train. Some of these linkages are virtual, as a lot of our communication occurs on aacimwaapiikwi (the internet). Much has changed for us as a people, but these paths still link us to Myaamionki and to each other. These connections are used, just as our ancestors used the trails of their time, to maintain our big Myaamia family. Helen Hornbeck Tanner and Miklos Pinther, Atlas of Great Lakes Indian History (Civilization of the American Indian series; v. 174. 1st ed. Norman: Published for the Newberry Library by the University of Oklahoma Press, 1987), 40-41. Tanner, Atlas of Great Lakes Indian History, 20-21. Harvey Lewis Carter, The Life and Times of Little Turtle: First Sagamore of the Wabash (Urbana: University of Illinois Press, 1987), 16. Bert Anson, The Miami Indians (Norman: University of Oklahoma Press, 1970), 21. Tanner, Atlas of Great Lakes Indian History, 14-15. Trowbridge has a list that includes roots and tubers for both food and medicine see C. C. Trowbridge, W. Vernon Kinietz, and Burton Historical Collection. Meearmeear Traditions (Ann Arbor: University of Michigan Press, 1938), 64-65. Tanner shows the location of the Great Black Swamp see Atlas of Great Lakes Indian History, 14-15. Trowbridge, Meearmeear Traditions, 27-30. Carter, The Life and Times of Little Turtle, 14.